Bob is a former newspaper columnist who shifted focus to writing plays (because he prefers windmill jousting to reality) and other script-based forms, but he is also flirting with the idea of getting back into columns of the online variety. He has two produced full-length plays under his belt -- Cat and Mouse, published by Playscripts, which has been produced in Singapore (in English), Estonia (with an Estonian translation) and New York City (in English again, as a rewritten workshop production called Four Square), and Chaos, and Other Worldly Possessions, which was workshopped in New York in October 2013 and is actively looking for a new production. He currently has two other mostly completed plays (Trolls and The Devil's Workshop) looking for a chance to be workshopped, and a third with a working title of Love: That Really Bad Feeling in an early draft stage. He is also working on an audio series called The Travails of Timmy slated for production in spring 2015. 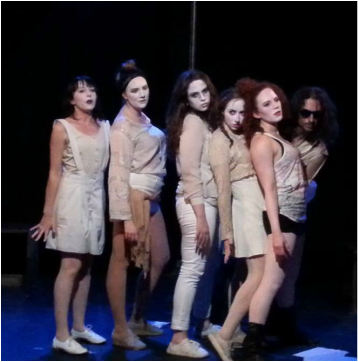 Electronic versions of these scripts are available upon request if anyone is interested in tackling new theater. Just email him at rateague2010@gmail.com and he'll hook you up. Or, if you are a member of the New Play Exchange, you can check Chaos and Trolls out there. He'd love your feedback. If you are not a member, consider it -- free to cheap and a good way to participate in new play development. He also has a couple of short film, written in 48 hours and shot in a week on an old Flip camera for Left Hip Productions' Theater Reel project in 2011. Click here for "Good Morning." Click here for "Last Manchild Standing." 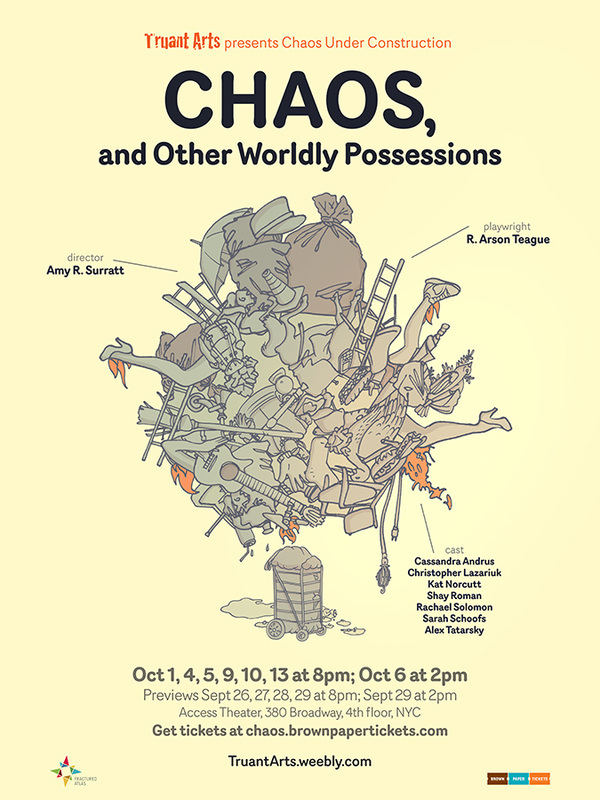 ABOVE: The poster for the workshop version of Chaos, aOWP, by the embarrassingly talented illustrator and theater lover Kristy Caldwell. Click on the image to see more of her work. ABOVE: Gabi Van Horn and Nick DeMarco in Four Square, workshopped at Access Theater in New York City in 2011.